Jenny D. Daly, CDFA™, CFP®, CRPC® and Vice President/Wealth Management, joined Janney in October, 2017 and is already making a positive impact in both her clients’ lives and her local New Jersey community. She has a close relationship with her clients and is always looking for opportunities to give back to charities they support - whether it’s attending an event, volunteering, or joining a local team. 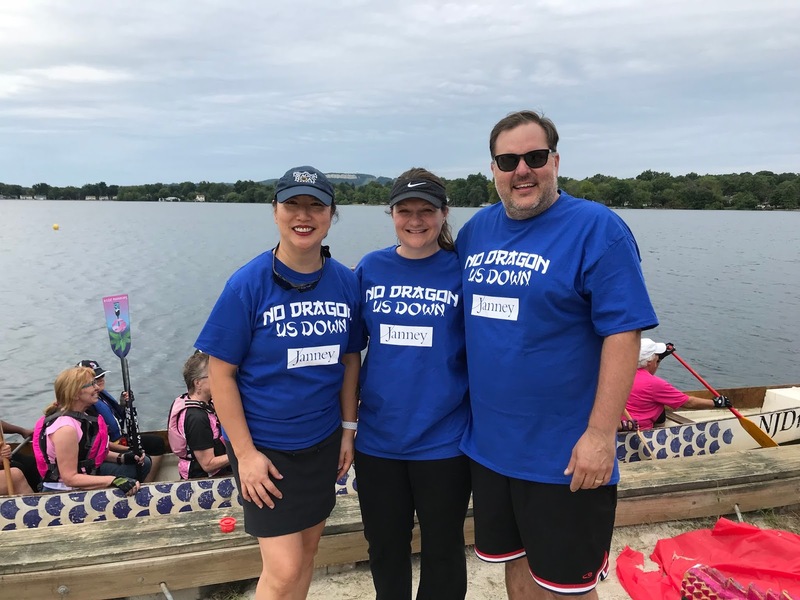 This year, she went above and beyond when she sponsored and participated in her client’s Dragonboat team called “No Dragon Us Down,” a name that Jenny created. The Dragonboat Festival, held on September 8, was organized by Pathways Save Our Sisters (SOS), a group of breast cancer survivors and supporters who are committed to the fight against cancer. Jenny joined her long-time client Lynda Lee, an executive at Pfizer, on the team and sponsored their t-shirts, which included Janney’s logo. Jenny’s husband, Scott, also paddled as part of the team at the 10th annual race. 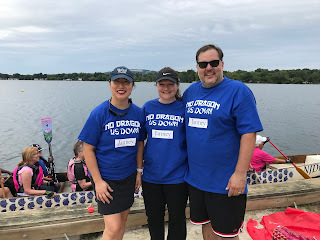 Team “No Dragon Us Down” at the second annual Dragon Boat Festival on September 8. Pathways SOS refers to itself as a “floating support group” that is committed to providing opportunities for women to have shared experiences and heal. There are currently over 50 survivor teams across the United States, with four in New Jersey. “It was really touching when the group had a moment of silence and each participant threw a pink carnation into the water to represent all of the women who have battled breast cancer. I think we all have been affected by this disease. My aunt, three clients and two friends have been touched by breast cancer, which makes it personal for me and drives home the importance of participating in events like this. As women, we all need to think about prevention and detection at any age,” said Jenny. 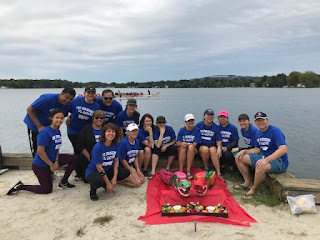 Dragon Boating is representative of the struggle with nature and the fight against adversity, where paddlers are able to give it their all and gain strength paddling in unison and fighting together. This is a concept that many breast cancer survivors can relate to. Jenny said, “Janney’s culture is very much in line with how I view my client relationships. It has a family feel because of its size. I love my work and am a mother of three. It’s nice that Janney has flexibility and support, which allows me to work from home when necessary. I feel like my voice is heard here and I no longer feel like a small fish in a big pond,” she said.